On 13 May, police in Newham, East London announced they would not bring any charges against Jasmin Stone, a prominent figure in the Focus E15 campaign and supporter of the RCG, who had been arrested during a political occupation in April. This climbdown represents a clear victory against the attempts to criminalise the fight for social housing. 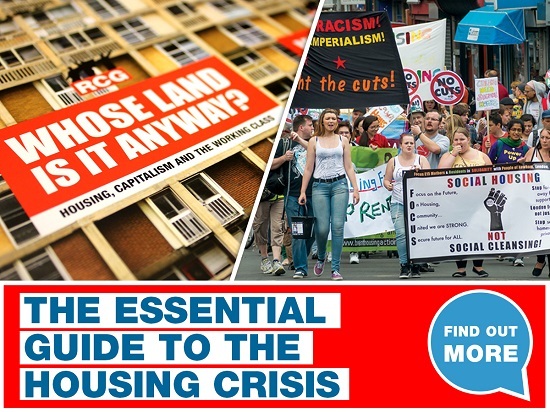 The Focus E15 campaign and its supporters, including the RCG and the Friends of Queens Market Campaign, had been involved in supporting a council tenant in reoccupying the flat from which she had been evicted two weeks earlier. Jane Woods had lived in her flat for 21 years but had recently fallen into arrears. Despite her family offering to pay off the outstanding amount, the council took the decision to evict her. Jane decided to fight back and, with supporters, occupied the flat for three days. Then Newham Labour Council called in the police. The whole operation was a clear attempt to intimidate a leading member of the fight for council housing. Here is Jasmin’s account of the incident, and of the collusion between Newham council and the police to attempt to quash that fight. ‘On 13 April, I was arrested for squatting. This was an illegal and politically targeted arrest. I was one of many supporters helping Jane politically occupy her house. I was returning to the occupation after supporting another family at court. Jane had been called to attend a meeting that day at Newham Council’s housing office. This was positive and we felt we were on the brink of forcing the council to rehouse her. As I walked up to the house, where my mum, daughter and nephew were waiting for Jane to return, I noticed the security company which boards up empty properties was waiting outside, along with council representatives. As soon as I set foot inside Jane’s flat, the police appeared and ran upstairs, threatening to smash the door down if we didn’t open it. I repeatedly read the section 144 we had stuck to the door which explains that the occupation of this home was legal; as legally required I told them I have a home, I never have lived at this property and do not intend to ever live there. Despite this, after 30 minutes the police began violently – and illegally – smashing the front door down. My daughter was screaming and we were begging them to stop as they were scaring the children. We offered to come out, but they wouldn’t let us or the children leave the flat. By now a crowd had gathered outside demanding the police stop. There were around 15 police officers present to enforce this illegal action against me, two other adults and two young children. They held us in the house for another 40 minutes demanding the children’s names and threatening to take them into care. Members of my family were outside who could have taken the children from us, but the police refused to let the children out of the house. The police told all three adults that we were being arrested; once we gave our names, however, I was the only person to be arrested. I was taken to a detention centre in Leyton. Supporters outside the flat were given false information by the police about where I was being taken. But they found out anyway and mobilised a protest outside the detention centre. I could hear the chants of ‘Let Jane come home’ and ‘Free Jasmin Stone’ from my cell. I had my DNA taken and was searched. I didn’t answer any of their questions. I was released after six hours, with a requirement to return to the station at a future date. Ultimately no charges were brought against me – with ‘a lack of evidence’ given as the reason. This shows the corruption of the police who were aware that my arrest was illegal from the start. Newham Council promptly released a statement following my arrest, claiming they had acted to take back ‘an illegally occupied council property’. A spokesman for the council admitted that the police action to forcibly retake the flat had been deliberately scheduled to take place during Jane’s appointment at the housing office. This is the first time the campaign has seen the council and police openly work together. It is clear that this is the main job of the police – to represent the interests of the state, and their interests are to stop the fight for housing and the fight against austerity. I was arrested in order to intimidate and silence me, I was threatened with having my child taken into care, but it will take a lot more than their intimidation. These attacks come with another victory for the campaign as Jane was ultimately rehoused in the borough in council accommodation. The RCG understands the need to defend our democratic rights in the next phase of this fight against austerity, and as the state attacks these rights, we will challenge them and defend those taking up the fight every step of the way. Defend council housing! Defend the right to protest!